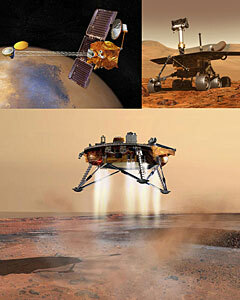 Artist’s concept drawings of Mars Odyssey, Rover, and Phoenix Lander Missions, confirming evidence of past liquid water and current water ice on Mars. Mars Within Reach is an interdisciplinary exhibition that will allow visitors to touch, hear, and interact with data from several recent Mars missions. The exhibition blends planetary science, engineering, and music to demonstrate scholarship related to the exploration of the Martian Arctic, with special attention to making the content accessible to persons with visual impairments. Location: Robert E. Kennedy Library, Learning Commons 2nd floor. The exhibition is free and open to the public during regular library hours. Metered parking is available in the H2 lot adjacent to the Library. Additional parking is available by purchasing a $5.00 general use permit from the Grand Avenue kiosk. 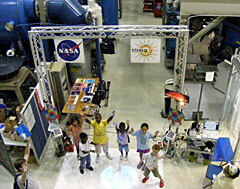 ” A Walk on the Sun: Knowledge Through Music” demonstration, hosted by the composer Marty Quinn. The exhibition will also include a special one-day workshop, “A Walk on the Sun: Knowledge Through Music” hosted by the composer Marty Quinn of Design Rhythmics Sonification Research Lab and Cal Poly professor and planetary scientist John Keller. The workshop will be presented to an audience of persons with visual impairments, mentors, educators, and the general public with an interest in the topic. In the workshop, participants will explore “images” of the Sun, Mars, and other planets by moving their bodies through a virtual reality space and listening to music corresponding to various features on these Solar System objects. The workshop is designed to increase accessibility and provide new ways to explore and interact with scientific data. Participants interested in registering for the workshop should contact Catherine Trujillo at 756-2305 by November 7th, 2008. 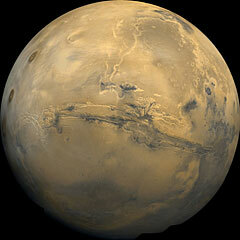 Global Mosaic of Mars Centered on Valles Marineris. Hooray, Friday! It's 4:05pm right now.